Appetizers: - Clams Casino, Chicken Wings, Calamari, Coconut Shrimp, BBQ Nachos, New England Clam Chowder, Chili, Pickle Fries, Crab Cakes, etc. Sandwiches, Salads, Flatbread Pizzas and Raw Bar with Local Oysters BBQ - our meats are smoked in-house with a delectable selection of homestyle sides! 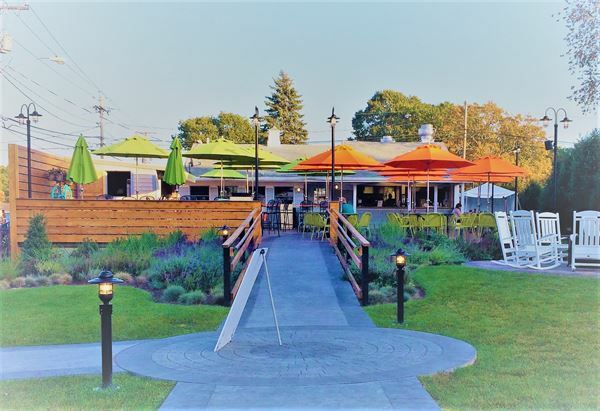 - Sliced Brisket of Beef, Pulled Pork, BBQ Chicken, St. Louis Style Ribs (and famous Mac 'n Cheese and Chopped Kale Salad) Surf or Turf: - Stonington Scallops, Fried Oysters and Whole Belly Clams, Fish & Chips, Dog Watch Seared Tuna, Steak Frites, etc. Custom packages designed for every event - whether you are looking for a casual BBQ or Surf and Turf or heavy hors d'oeuvres stations. Email us for more info and we can build a package that best accommodates your needs! 800 sq ft event tent with heating, music and lighting available for private parties April-November. Accommodates up to 60 with the sides down and heaters on, and 75-120 in the summer months. Inquire with Dog Watch Catering for seasonal rental and minimum rates. Indoor dining room with fireplace seats up to 40 and adjacent bar offers standing room and additional seating for 20. Available to rent in the off season for private parties. Inquire for available days/times and pricing.